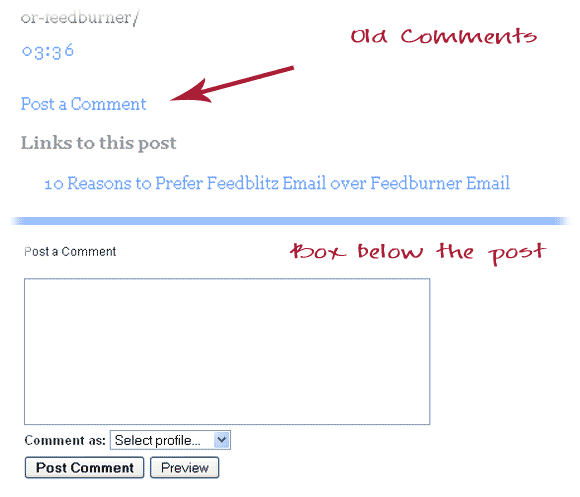 Installing Wordpress Alike Comment Boxes on Blogspot Blog Blogger, Do Something to the Comment Boxes – MillionClues! This is an open email to Blogger (Google) to tell them that, the crappy comment system of Blogspot is killing the spirits of bloggers. Have you ever commented on a Blogger (blogspot) blog? Whoever designed Blogger must have thought that, people on the web had all the time in the world. So they casually created separate comment pages that would either pop-up or load separately when someone choose to comment. On to that, Blogger blogs do not store your details (Name, email id and website) as cookies. Each time you visit a blogspot blog, you have to type these in again and again. Just for a comparison (in case you are a google employee), wordpress has a comment box right below the post. Once someone comments on a wordpress, it saves your information as cookies and fetches that when he returns the next time. Please fix the comment boxes. If you can’t find a good coder to do that, do tell me. I know someone who can do that for you! Comments inspire bloggers to write further. Newbie bloggers on WordPress are getting much more comments that blogspot bloggers. Save the bloggers! P.S: If you are yet to start a blog, do it at wordpress.com or get a self hosted blog at wordpress.org. Well said, this is something that has worried me for a while as well. Somehow these blogs just look as if they have not been completed. It looks as if the entire idea of commenting was only added on after wards. Amen to that. Blogger has a very bad commenting system. WordPress – very easy. Blogger – convoluted and complicated. Why don’t they make it easier? Yes man, We have to spend at least 2 minutes to fill up all the fields and stuffs. plus the time taken to write the comment, which cannot the avoided ofcourse. In Worpdress, it takes only the time taken to write the comment. So people tend to leave more comments I think. Well, I think all you guys are not aware of the changes that Google made to blogspot. It already introduced the ’embedded comment form’ to the blogspot blogs way back in october 2008. It has to be enabled from the settings though. Once you enable you get the said ‘comment form below post’. It’s just that bloggers are not aware. What? You need the help of cookies to enter your name and URL? Anyway, since you’ve said that, I’ve tried commenting and found that cookies were active and my URL and name were saved on that site. So it’s gotta do with the browser rather than Blogger. I always use Firefox, which saves everything. But I have never seen a blogger blog storing anything. Its the website that choose the store cookies rather than the browser. The browser stores the informtaion and comes down as a drop down when you type one character. Its not that we need cookies, when people see the comment boxes filled up, the chances that they leave a comment is more.. What say..? You are absolutely right. I don’t comment on most of the blogspot blogs. Aren’t they just over on safety? Anyway, 3 clicks isn’t so hard to do. Thanks for dropping by… Cheers.. I find many blogspot blogs difficult to leave comments on however there are other platforms that are equally as tiresome. Injader comes to mind as does Typepad. Both of those seem to make you jump through hoops to leave your comments. I don’t want to join sites nor do I want to have to try to read the captcha images over and over again. As for remembering my information, it seems that FF does that automatically as it tries to fill in the blanks for me with the typing of one letter. You think that Blogger blogs would be well-advised to move to Injader? 🙂 There isn’t a way to import Blogger posts and comments yet, but perhaps there will be at some point in the future. Right you are right. Blogger is along way back. Could you please mail me who is that friend whom you mentioned that can help in coding. Thanks. Lol, the coding has to be done in the blogger software, not on your site. You can try the links I have included or @Sriraj mentioned to install Intense Debate. The coder I know is @Binny, he is a professional programmer and a freelancer. You should see his profile sometime. he has written a lot of wordpress plugins. One of his plugins called Eventr is used for BarCampKerala Registration procedure, Thanks Binny. The links look very disordered when it reaches the inbox, Amal has subscibed to the thread so his inbox should be looking like a jungle of code. You cant leave comments? No idea. Is it like a ban or something..? I can`t add comments on Blogspot blogs. I tried to in able cookies and it still doesn’t`t work. I use Firefox. Can someone please help me? like this one Arun. nice to read on your blog. Nice post instead of intense debate. I am using disqus on my blogspot site. Trickspagal.com Can plz suggest which will be better among them. Should I change it to intense debate.. I think Disqus is quite good. Stick with it?